We built our house back in 1993, and many years of hard use by many people has left it showing its age. Here’s a picture of part of the cabinets in the girls’ bathroom to give you an idea of how we began. Nothing terrible, but definitely tired-looking. Not long ago I saw an awesome cabinet spruce-up project on Pinterest that left me determined to give our boring bathroom cabinets a nicer look, hopefully for a reasonable cost. As the tutorial recommended, I bought General Finishes Java Gel Stain. I used about half a quart for two bathrooms. It goes on really nicely, is very forgiving, and is a lovely color. I began by washing and very lightly sanding the drawers and doors, then used cheap foam brushes to put on the stain. (I actually got a 10-pack of foam brushes at the dollar store.) Here’s how one of the cabinet doors looked after one coat of gel stain. And here’s another shot of the door with an un-stained drawer resting against the sawhorse below it, so you can see the difference in color after only one layer of stain. I went on to do two more layers of stain, and then a couple layers of poly finish. Here I veered away from the tutorial and slightly regretted it. Monica recommended a water-based General Finishes Poly/Acrylic Satin for the finishing coat. I opted to use an oil-based poly finish that we already had. My poly actually dissolved some of the stain in some places, even though it had dried well, leaving me with bare spots I had to stain again. Next time I’ll definitely be buying the poly that was recommended for the job. 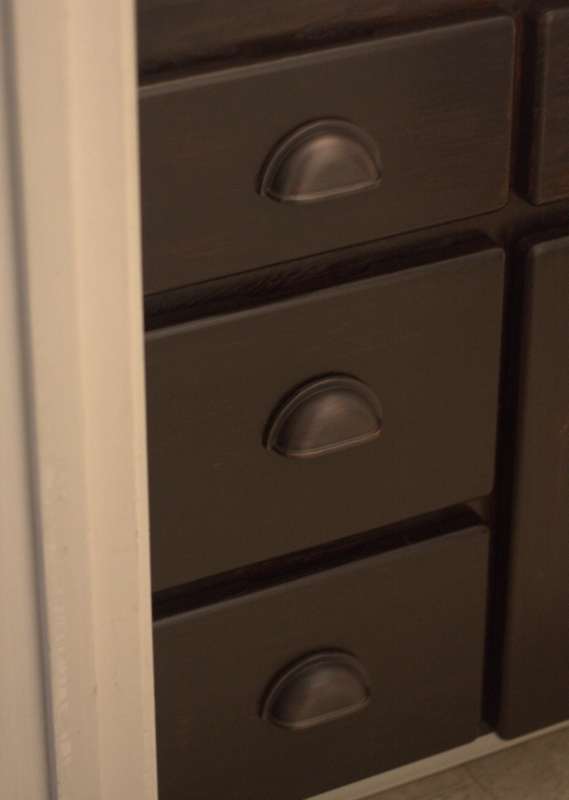 Here’s a shot of those original drawers totally finished, with some new drawer pulls added. I loved the way the cabinets looked before adding the new pulls, but think the new hardware was a wonderful finishing touch. After pricing similar pulls at Lowes and Home Depot, I ended up buying from Overstock.com. Here are the drawer pulls, and these are the knobs we picked for the doors. The drawer pulls were $2.90 each and the door knobs were about $1.50 each. We got 25 of each, enough to do two bathrooms and our entire kitchen, for $108 with shipping, a price that beats the socks off Lowe’s or Home Depot. 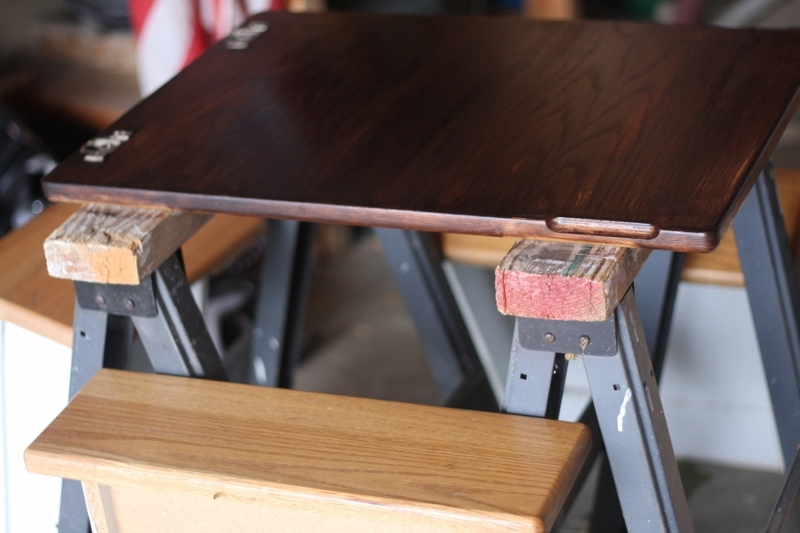 The pulls are very sturdy and look great with the stain, I think. They shipped like lightning, too. I’m amazed at how nice my old cabinets look with these simple additions. Here’s a picture of the girls’ bathroom cabinet all finished. And in case you’re curious about my dotty walls, here’s the post where I showed how I did that. And here’s a shot of the other bathroom I did, our master bath. I still need to stain the oak mirror above the sink. But I am just as pleased with the look here as I am in the girls’ bathroom. That means the whole project cost about $40 per bathroom, with lots of stain and poly left over. I’ll probably use some of the leftover stain on pine moulding to frame the girls’ bathroom mirror (like this). I also need to finish around a mirror in our bathroom and stain some shelves in both bathrooms. But I’m so thrilled with how everything turned out so far that I just had to show it to you now, unfinished bits and all. This is a totally doable project and I can’t wait to work on my kitchen! That is a beautiful outcome! It looks beautiful! How much time did it take? I did both bathrooms at the same time– brought drawers and doors out to the garage– and it took about half an hour per coat. The framework of each cabinet took maybe another 15 minutes per coat. So, it was maybe 3 hours total of hand-on time for both bathrooms combined. The slow part was waiting for the stain to dry. That took a good 24 hours per layer. The polyurethane only took a couple hours to dry. Altogether, the bathrooms were torn up for about 5 days, I think. It turned out beautifully! Wonderful job – doesn’t it feel great to have done something so awesome – yourself?! Thanks for sharing. Wow-I’d love to do this to our main bathroom’s cabinets. Ours are from the 1980’s and really need a change. Thanks for the idea and I hope to do it over Christmas break with hubbys help. 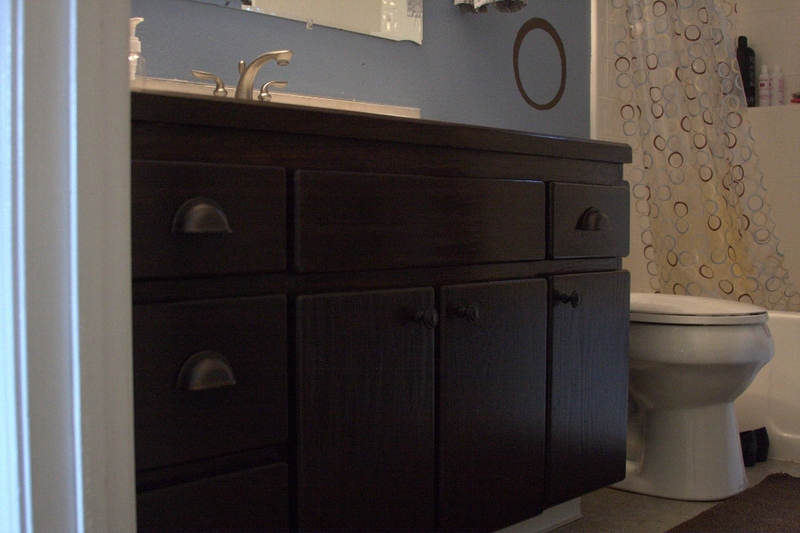 I’m not usually a fan of the really dark wood (probably because I have so much of it in small spaces that makes everything look even smaller), but it looks fantastic in your bathrooms. Great job! 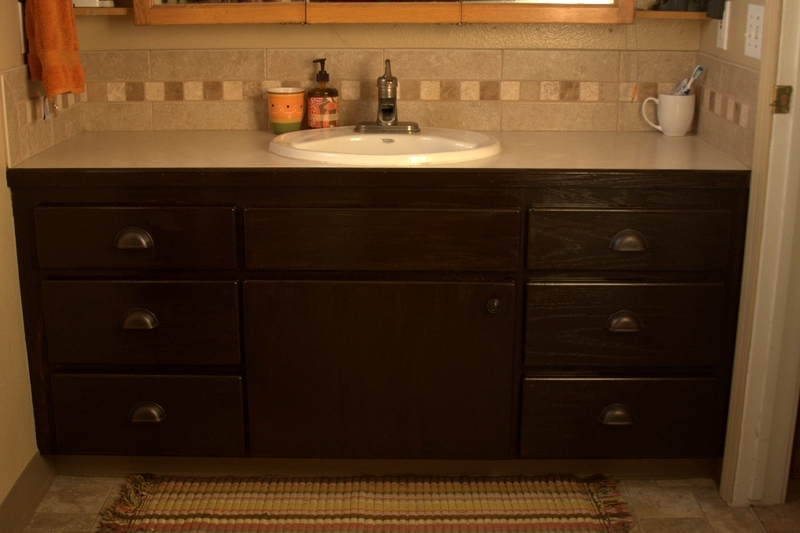 It is always amazing how much a coat of paint/stain and changing the pulls can completely alter the look of something. 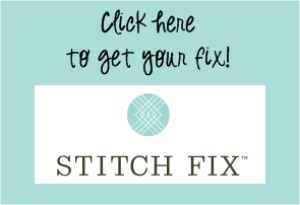 For DIY projects check out NellieBellie.com—some of them are neat. Great job Mary! I so want to redo cabinets in our house. They are so scuffed up from the chair though, not sure what can be done. That looks pretty classy. 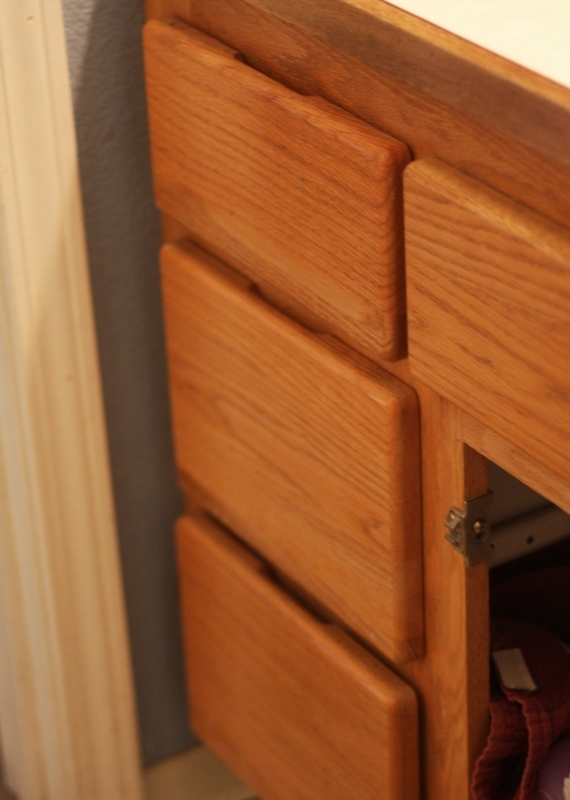 Those kind of drawer pulls are great…until you grab the spider that’s hiding up inside one! Love it!! You’ve got me thinking about tackling my kitchen! Looks wonderful! Amazing what can be done with a little money and time/effort put in. That looks great! Good for you doing it yourself. They look amazing! That is the exact color I would like my kitchen cabinets to be. I had considered paint in that color, but after seeing your project, I think I’ll go with the stain. 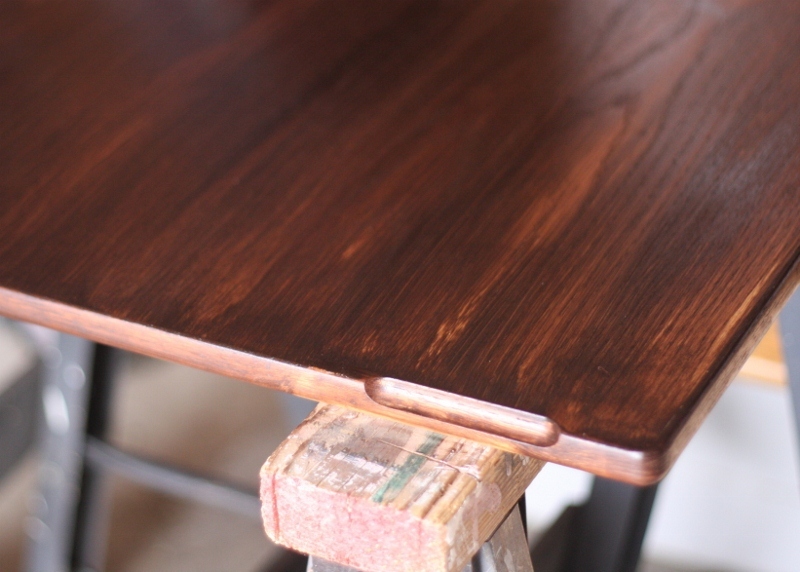 I did a satin finish, but you could certainly do a gloss finish if you want, and do several coats for durability. I had cabinets like that in a house once. While they were great quality, I never liked them. Never in a million years would I have thought to do that…they look GREAT!